Did the Romans eat strawberries? Summer is upon us. I can’t really be bothered to sit at the computer. Mild air, soft rains, hot sun and dusty blue skies … the time for indoor activities is the winter. All I can think of, this evening, is that I intend to go out tomorrow to a farm near my home, and purchase some strawberries. Let us, then, think of strawberries. Did the Greeks and the Romans eat strawberries? It seems that they did. In Kevin M. Folta, Genetics and genomics of rosaceae, p.422, I find a discussion of the strawberry in the ancient world, telling us that Greek authors do not mention it, nor the authors of Egypt or the Bible, in which lands, of course, it does not grow. But it does grow wild in Italy, and there are, apparently, a number of references in classical literature to it. The Latin word for the strawberry is ‘fragum, -i‘, plural ‘fraga‘. In his 13th book he refers again to ‘mollia fraga‘. XXVIII. The flesh of the ground strawberry is different from that of the strawberry-tree which is related to it, the strawberry being the only fruit that grows at the same time on a bush and on the ground. The tree itself is a sort of shrub; the fruit takes a year to mature, and the following crop flowers side by side with the earlier crop when it is ripening. Authorities disagree as to whether it is the male plant or the female that is unproductive. The fruit is held in no esteem, the reason for its name being that a person will eat only one! Nevertheless the Greeks call it by the two names of comaron and memaecylon, which shows that there are two varieties of the plant; and with ourselves it has another name, the arbutus. Juba states that in Arabia the strawberry tree grows to a height of 75 feet. The Censor was always anxious beyond measure for the welfare of his strawberry beds, and took dire vengeance on any of his gardeners who ventured to neglect them. There is a mysterious reference “D.B. 1880” in this, but I can’t see enough to work out what it is. Likewise pseudo-Apuleius, the 4th century author of a ‘Herbarium‘ or ‘De herbarum virtutibus‘ — apparently a 6th century copy exists at Leiden, according to French Wikipedia, is said to mention the fruit. The author seems to be called Apuleius Barbarus also. Editions are hard to find! Unfortunately, because herbals are illustrated, people seem to print copies of particular manuscripts. A German edition of an early Middle English version exists at Archive.org. I’m afraid that I cannot, therefore, check this reference. Unfortunately he gives no reference for this. UPDATE: Nearly all the references to the classical history of the strawberry, including those of Dr. Folta, clearly go back — the wording is so similar — to U.P.Hedrick, Sturtevant’s notes on edible plants (1919). This may be found here. Another link reveals this. I should note that the various manuals of cultivation also state that the modern strawberry is derived, not from these small fruits, but from a hybrid of two American varieties of considerably larger size. The Romans had no access to what we today would call a strawberry. My strawberry days are, alas, as gone as the Roman Republic. Kidney stones. Take some chocolate with it. That, too, is off-limits. By the way, if you ever want a reason to cross your legs and keep them crossed, look up the ancient world’s treatments for kidney stones. Yes, that’s exactly the feeling! But so much about the “Wind in the Willows” is superb, isn’t it? Mind you I always thought the story lost its way with Toad being put on trial etc. of summer and strawberries….thanks for the inspiration. 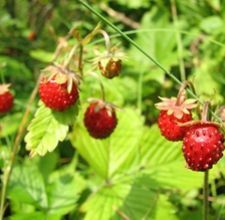 Those of us who live in Northern Michigan call what grows wild in our pastures and meadows “wild strawberries.” The taste, I must say, is superior to the domesticated variety in a good year, inasmuch as the latter is bred for size and color, rather than flavor. But it hasn’t been a good year, per se. Lots of wild strawberries, but too much rain to have much taste. Nice to have the choice!